Oh my! So much that I would like to tell but not enough time. 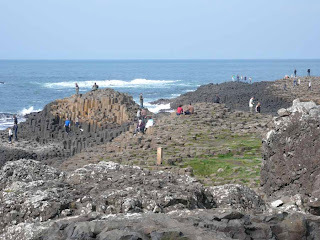 The three train journeys on Thursday took us from the very South of Ireland almost to the very North. 3 hours Cork to Dublin, 2 hours Dublin to Belfast and another hour to Larne. The time just flew as we tatted most of the way. 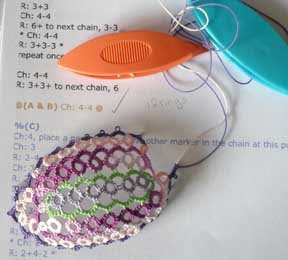 I was making Jane Eb's little SCMR butterfly...my favorite to way to use up a yard/metre of thread. I had printed little cards to stick them on to have something to give away. A lot of them never made it to the cards but were given away on the train! 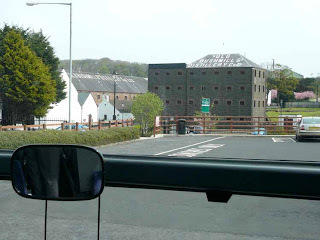 Larne is on the East coast of Northern Ireland, just across from Scotland, the shortest ferry crossing goes to Stranraer. We were met and taken to our 'place'! (You can read all about it if you wish). 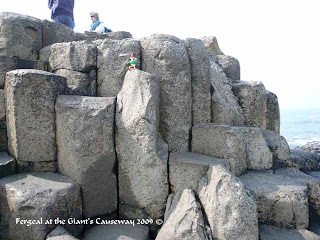 I had not known what to expect, except that it was a convent and maybe a little spartan!! Oh my it was amazing. The original house was built in 1873 by the Smiley's. Sir Hugh had married a scot from the Coats and Clark thread family...now how cool is that!! In 1928 the house was sold and sold again in 1929 when it was bought by the nuns. The house had been stripped of all its furniture which had been auctioned...what a shame. 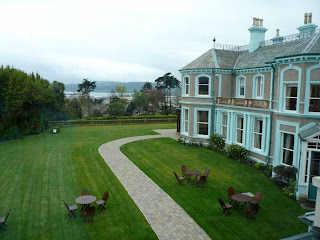 The nuns wanted it as a convent and a retreat for ladies. 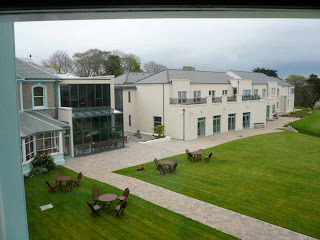 Nowadays it is a retreat and conference centre run to perfection by only 3 ladies, Sisters Margaret Rose Sister Anna and Maura. 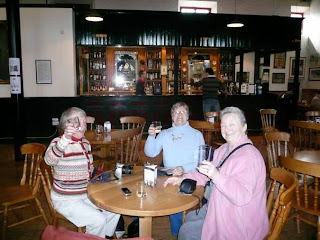 Nothing was too much trouble for these ladies to do for us! 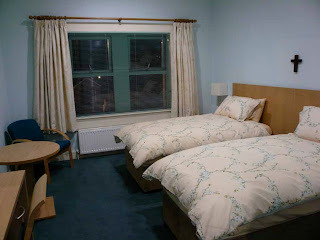 In 1960 a new accomodation block was built, it was demolished and a new extension built and opened last September. 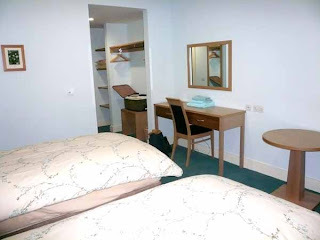 It is fabulous, all ensuite rooms, lovely dining room and conference rooms. Perfect! 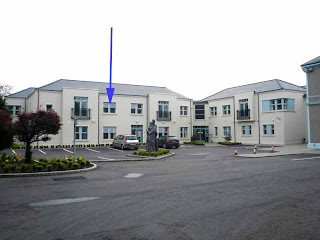 You can see my room, the purple arrow. Very simply, but elegantly furnished. 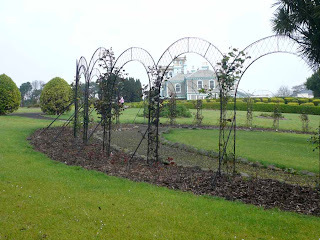 The extensive grounds were being redeveloped, here is the new Rose garden. Just too much to show you. Later we were given a tour of the old house.. I will show you that later if you would like. We were greeted with a high tea of Beef Strogonof even before we saw our rooms, which was very welcome. 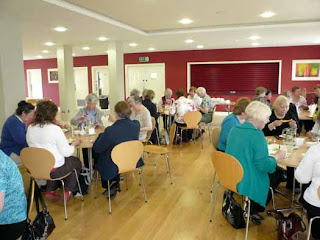 It chanced that on Thursday evening the Womens Institute in Larne meet here to do crafts and we were welcomed into their midst. What a talented lot of ladies making beaded jewellery, bargello, tapestry, and so much more, too much to take in. We of course invited them to our sessions!! and they came! 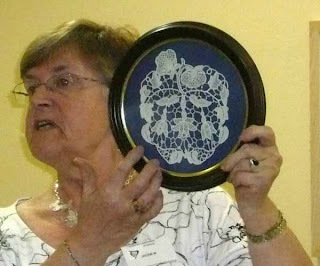 On Friday morning we made lace with the ladies of the Northern Ireland Lace Guild..our hosts. Another wonderfully talented lot. 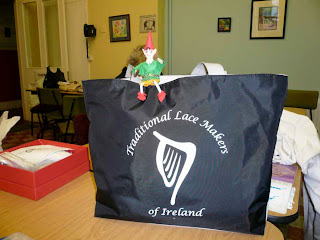 Fergal decided to take an interest in other laces and became an honorary member..so he thinks. 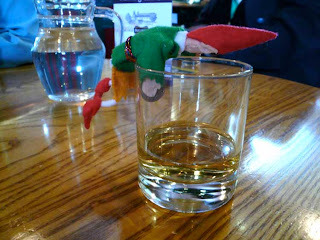 he wants to post his experiments on the Leps own blog...see link in side bar...sometime soon!! when he gets his act together. We had all been asked to make something with a butterfly theme that weekend. 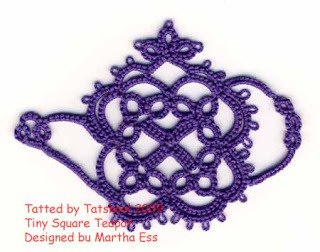 I took a tatting pattern but never even started it. 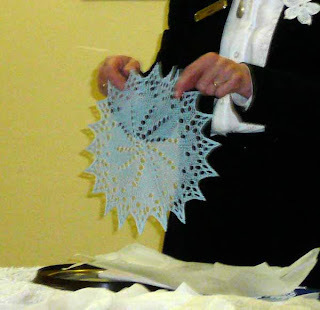 This is the Carrickmacross lace pattern that I started.... you can see the pieces on the table. I just about managed to get the bits all tacked together....tissue paper with the pattern on top, then the net and finally the organdy. 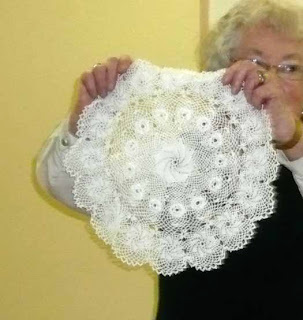 The only other time we got to make lace was on the Sunday morning..the rest of our time was action packed! I did get to start the couching on my project but it will take me a year to finish it!! 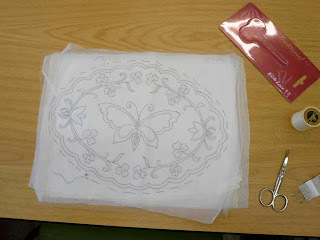 So why didn't I make a large tatted butterfly...well everyone who saw my tatting really appreciated for the first time!! and several wanted to learn,, from my guild and from the Women's Institute and from the Northerm Lacemakers so I had the makings of a few more tatters to fill my time. 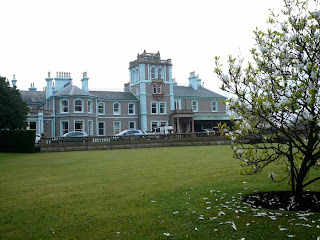 In the afternoon we got to walk into Larne while some of the group met the Mayor. 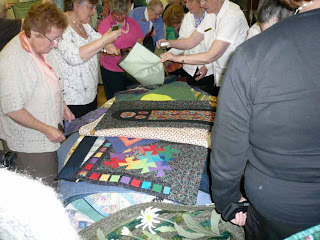 On Friday evening two ladies came to show us their patchwork....a mind boggling selection of traditional patchwork, free form work and applique. I couldn't even begin to show you....not without permission anyway. But here is my group getting a closer look at the end of the talk. Then it was our turn, each to talk about something we had made....my tatted doileys in Blue lagoon and Coral Reef, 3 Geckos and a series of Hearts Desire in all my colours went down well as also did samples of my threads...they had never seen the like!! 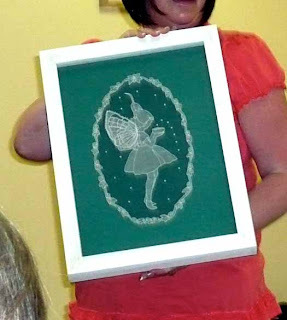 Our lace makers do so many things....Carrickmacross, Limerick, Youghal, Tambour, Bandon, Bobbin, Mountmellick embroidery and more. 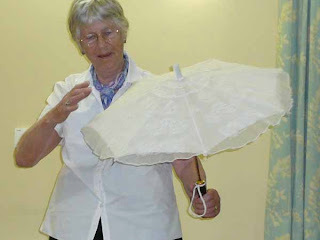 Jill had recovered an old coaching parasol, simply beautiful. 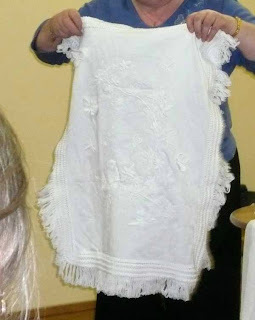 This is Mountmellick embroidery, white stitches on white sateen heavy fabric...I am trying this too. 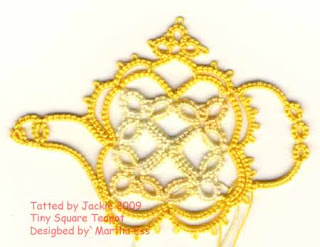 I am not even sure what kind of needlelace this is by Jackie. 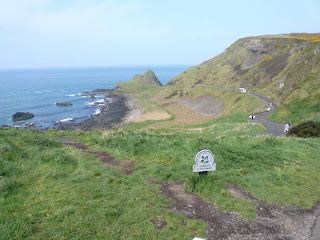 and so much more...there were 33 in our group from Cork. And that was just our first full day. 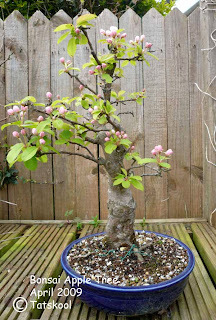 My Bonsai Apple Tree is coming into bloom. It reminds me that it is year since I started dye my own thread. See the original post here. 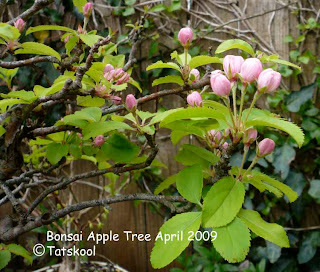 It was the beautiful, delicate colours of the Apple Blossom before the flowers turn white as they open, that inspired my Apple Blossom thread. That reminds me also that I must dye more...but not just yet...other things to do. 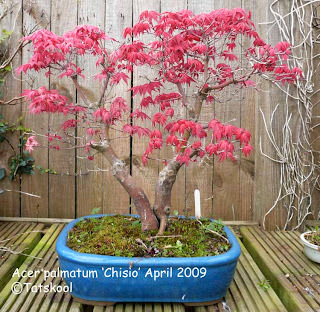 All my bonsai are coming to life, the Japanese maples are just wonderful when the leaves open. Look at this beautiful 'Chisio. I have had this one for 8 years and it gets better every year. I wish I could show you them all, but I don't even have time to look after them as they should be looked after...too much thread dyeing!! There are 119 blog posts waiting to be read too!! 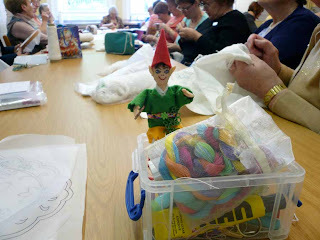 This weekend I am having a treat and going away with my Lace Guild. 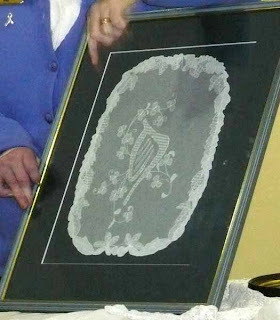 We have been invited to visit the Lacemakers in Northern Ireland. 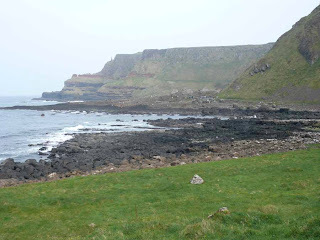 This will only be my third time in Northern Ireland. 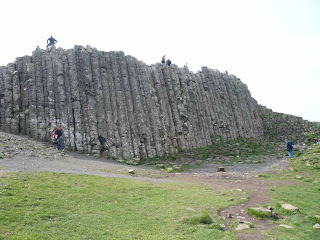 Tomorrow it will take most of the day to go up there on the train to Larne, via Dublin and Belfast. We will work as we go so it won't be tedious to me. Maybe I will make lots of little butterflies to give away. 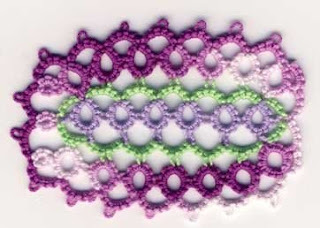 On Friday, I think we will make lace with them. We have been given a theme of butterflies that we will all make. 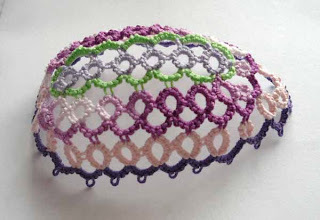 Mine will be in Carrickmacross Lace and of course also in tatting. It will take me more than a weekend to finish the Carrickmacross tho. Must show you my other attempts sometime, and how it is done. 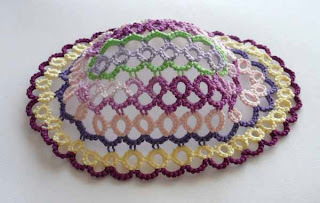 We are to take one item of our lace to show and maybe talk about. 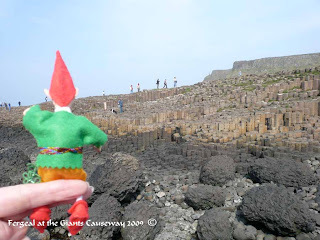 Then on Saturday we will go to a lace museum and to the Giants Causeway..something I have always wanted to see. Not sure what we will do on Sunday before we return home on Monday. This is the nearest I will get to the likes of Hector and Palmetto and Shuttlebirds. Should be fun. I have not been away with the Guild before and have borrowed a uniform!! White blouse and green raincoat to go with black trousers and a special Guild bag. 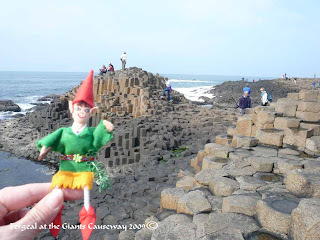 I wonder if I should take Fergal to see more of his country, or would he escape to do his own thing. I am going places today...in my bare feet! 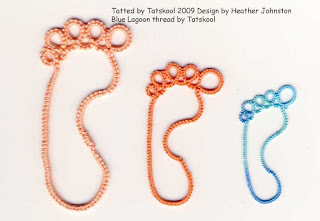 Heather Johnston has the cutest pattern for Tatted Feet. First I tatted Big Foot in size 10 Flora in a flesh colour. It is a size 3 inch foot! 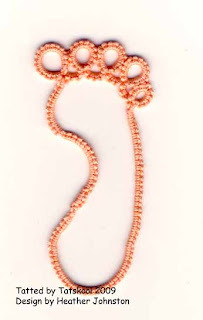 Next came a pair of feet in Flora 20 in orange. These feet are size 2 1/4 inches. Another pair started to walk away from me. Finally these feet really were made for walking!! I can just see these feet on a scrapbook page, just need the right photo. Let's put them together so you can see them all, daddy feet, mummy feet and baby feet! 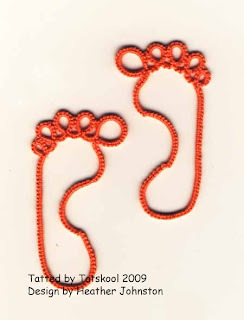 Baby feet are size 1 1/2 inches. They don't take much thread, about 2 metres for the mummy foot, and 1.6m for the baby foot. Getting the shaping right when blocking is the trickiest bit. 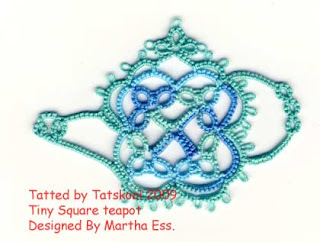 I have been tatting a ......!!! It's Number 32!! I have been doing a TIAS....Tat It And See for those not in the know...where you tat a pattern blindfolded.......well not literally that would be too hard!! I am addicted to TIAS's. Some are pretty easy but some are soooh hard...particularly the recent ones where there are written instructions and NO diagram...now how hard can that be...very hard! The one that I have just finished is by Dani and has been a killer!! I have untatted and cut out whole rows...something I have never done before...all in the interest of trying to work out what I was making. 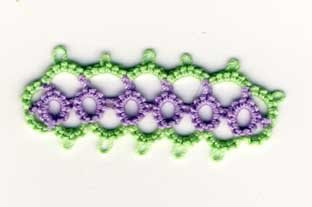 Day 1 would have gone fine if I hadn't made a mistake that I didn't notice and made one picot too many. Can you see it, 5 at the top and 5 at the bottom and the little blighter sticking out at one end!! That of course threw Day 2 out and if it hadn't been for the scans shown by Ladytats I would never have know why this round didn't work. Oh but I did like the pretty colours. So I did that round again and improvised with the extra picot!! Day 3 finished that round and all was going well apart from being a little lopsided!! Dani had given different options to follow...as if I wasn't already confused enough! and I picked Option A ...mainly because I made a mistake!! and also because it proved to be the shortest! I made a mega mistake of not realising that my pattern for Day 4 had continued over the page ...ooops! So Day 5 didn't work... I was a ring short!! so I had to cut off that row and do it again! Day 6 went fine and my Easter Egg was beginning to look like an Easter Bonnet with a brim. What would it be on Day 7 the last Day.....well day 7 didn't work for me, having done another 6 rings I deemed it a good idea to do a calculation and it seemed that I was going to be a lot of rings too many for the available picots left to join to. So I appealed to Dani for help...ahhha it finally transpired that some of my too many rings should not have been joined to the previous round...are you still with me????? 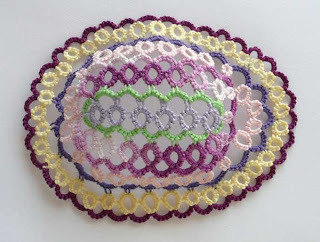 So after another lot of serious untatting I finally finished it last night and showed it to dear hubby. Now you are probably still wondering what I was that I had made...was it an Egg or was it a Hat????? Showed it to him and hubby knew immediately what it was. ..........It's a Chiton, he said. being a Marine Biologist he knows about these things...can't pull the wool over his eyes!! Now I realise that there may be one or two of you out there who don't know what a Chiton is so I looked it up on Wikepedia for you.....and we find that it is a primitive marine mollusc...well you knew that didn't you!! 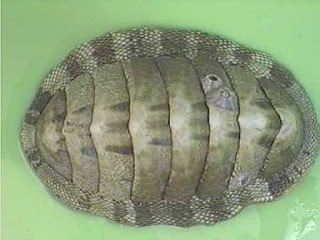 Chitons have a shell which is composed of eight separate shell plates or valves. These plates overlap somewhat at the front and back edges, and yet the plates articulate well with one another. 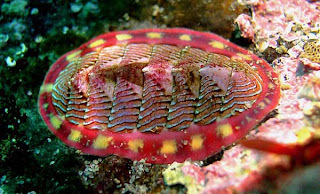 Because of this, although the plates provide good protection for impacts from above, they nonetheless permit the chiton to flex upward when needed for locomotion over uneven surfaces, and also the animal can slowly curl up into a ball when it is dislodged from the underlying surface. The shell plates are surrounded by a structure known as a girdle. my goodness isn' that pretty!! Another picture of mine and surely you can all see that I have indeed made a Chiton. You can even see how Dani has got the front end pointed and the back end blunt. Thank you Dani so much ( sorry for taking the mickey!!) I love my Chiton and he can be animal Number 32 in my continuing Animal Challenge (see mission statement at the top of my blog). 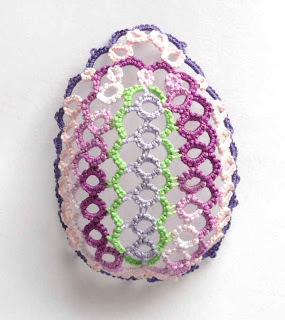 Of course I am still wondering why Dani designed a Chiton especially for Easter!!! 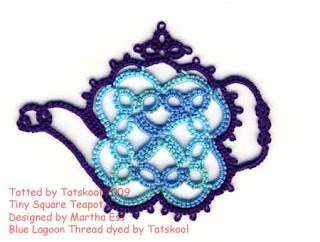 The first new teapot for me to tat in Martha's book is the Tiny Square teapot, mainly because my tat friends got their book today (and they LOVE it) and this was an easy one for all to do. My first one strangely enough looks a lot like Martha's one...why do I always like her colour choice!! This one is in size 20 Flora and is nearly 3inches wide. Now to go mad and tat it in something exotic..what could that be...why not Blue Lagoon from Fiji..now doesn't that sound nice. You just knew that was coming didn't you!! This one is in Size 40 Blue Lagoon with a solid Deep Turquoise Green from my BL solids for the outer round. I think this is beautiful. It measures just under 2.5 inches. My final teapot is again in size 20 and Blue Lagoon with a Flora deep purple contrast, very striking but I like the calmer second one the best. Isn't it funny the effect that the turquoise green has on the Blue lagoon colour in the second teapot. It looks very green while the last one looks very blue. I would like to try this teapot again with only the central trefoils in a different colour and the two outer rounds the a different colour. how I like to experiment. My friends got on well but Jackie was the only one to finish, here is her teapot.